Ill-fitting dentures have the potential to interrupt your quality of life. Besides daily discomfort, accidental slips, limited chewing or digestive issues, dentures that do not remain in place throughout the day are a hassle. It can negatively affect health and emotional well-being. Alameda Dental Care has changed patients’ lives with implant supported dentures. No more slips while talking or eating! These permanently placed dentures stay in place throughout the day and are more secure than traditional dentures. A regular set of dentures will fit over the gums using an adhesive to hold it in place. Some denture wearers have good luck with the adhesive, while many do not. 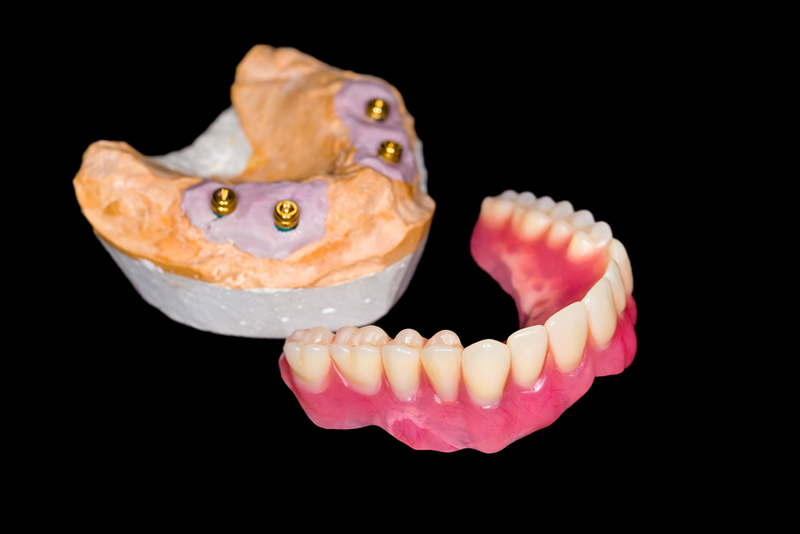 Implant supported dentures offer a more stable denture that will not move on its own. Instead of adhesive to hold it in place, they snap on permanent posts that are integrated directly into the jawbone. Dental patients who are interested in implant-supported dentures begin with a consultation with one of Alameda Dental Care’s highly-skilled doctors. Your dentist will take x-rays of the jawbone to determine if there is enough bone to place and support implants. Records are gathered to create the temporary dentures. Implants are surgically placed into the jaw bone during the first stage of treatment. Time (a few months) is given for the implant to fuse into the bone and the area to heal. An x-ray is used to view the implant. You will be able to wear the temporary set of dentures during this time so you are not without teeth. Once the implants are integrated into the jaw, an abutment is fitted into each implant. This post will secure the final dentures to the implants. Your Tempe dentist will teach patients how to properly care for your new implants and dentures. Daily cleaning regiments are explained. A follow-up appointment is set. Annual check-ups will help to increase the longevity of your implant-supported dentures. It is also important to report to your dentist for an annual oral cancer screening. When you do not have to worry about your dentures slipping or falling out while you speak or during mealtimes, there is a new-found sense of freedom. Follow your dentist’s home-care instructions for the best results. Address any questions or concerns with your Tempe dentist right away.